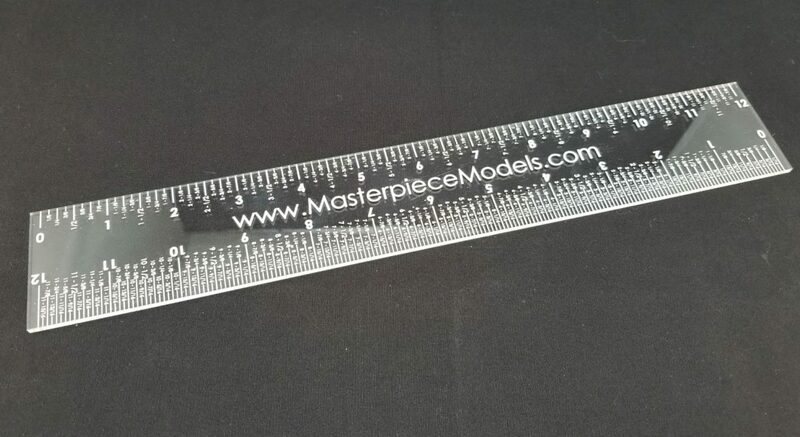 Today we’re introducing the new Masterpiece Models EZ Read Ruler. As a crafter and hobbyist I can’t tell you how excited I am about this new ruler. Measuring is a way of life for us crafters and hobbyists. Each time we create models or handmade cards, mini albums, and layouts we bring out the ruler and count an endless number of dashes, not once but twice, to ensure we read the correct measurements. Not only is this tedious work but it’s also not easy on the eyes. Scrapbooker extraordinaire Shellie Geigle of J&S Hobbies and Crafts identified the need for an easy-to-read measuring device. She communicated her idea to John Geigle of Masterpiece Models and the rest, like they say, is history. The Masterpiece Models EZ Read Ruler comes with Shellie’s stamp of approval! Click here and get yours today!